The Marion County Historical Society will meet on Saturday, June 21 at 2 pm at the Spades Park Branch of the Indianapolis Public Library. Joan Hostetler will present a program on how to date and identify old photos. Attendees are welcome to bring their old photos to the program, to have them identified and scanned. This program is free and open to the public - no registration is required. If possible, I would like to learn who my birth family was and about their genealogy. I know this unlikely. I was born at Union Hospital on December 29, 1956. When my adoptive family took me home, the hospital accidentally sent a pill bottle with my birth name on it. My adoptive family disclosed the first name to me; my birth mother had named me Barbara. Unfortunately, they did not tell me my birth last name. My birth mother was from the Sullivan County area. She was supposedly in college at ISU when she became pregnant with me. I was told her parents were farmers near Farmersburg. My adoptive name was Billie Sue Rogers. I was raised in West Terre Haute, Indiana. I graduated from West Vigo High School and then Indiana State University. 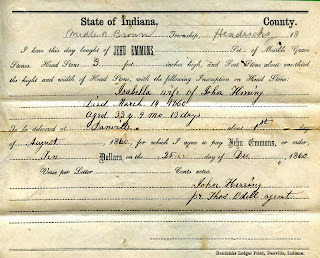 There are now 912 Hendricks County probate records online. These files are free to the public and are part of our Records Preservation Project. We are more than 90% finished with the unfolding and organizing of the probate records, which is the prelude to them being digitized. If you would like to help us reach 100% complete, come to our next work session on Saturday, July 5 at the Plainfield Public Library from 10 am to 4 pm. Please register online through the library's events calendar or contact the library's Indiana Room - phone (317) 839-6602 extension 2114. The Southern Indiana Genealogical Society will meet on Thursday, June 5 at 7 pm at the New Albany-Floyd County Public Library (180 W. Spring St., New Albany, IN). There will be a showing of the historical documentary, "New Albany: City By The River," which details New Albany’s historic past, preservation efforts, and the present revitalization of the downtown area. In creating the documentary, filmmakers Philip Collins and Daniel Frank interviewed more than 20 historians, business owners, artists, and community members at historic sites, businesses, galleries, and museums around New Albany. To see a preview of the documentary, please visit http://www.newalbanydoc.com/about.html. Local singer/songwriter Linda C. Casey will also be at the meeting to sing her original song, "New Albany." This meeting is free and open to the public - for more information about the Southern Indiana Genealogical Society, please visit http://www.rootsweb.ancestry.com/~insigs/nextmeet.htm. The Indiana State Archives in Indianapolis will host a free workshop on records preservation and access on Thursday, June 26 from 9:30 am to 4 pm. The workshop is geared towards those who work with and care for historical records. Officials from the Indiana State Historic Records Advisory Board (SHRAB) and the Indiana Commission on Public Records (ICPR) will present sessions on public records and access, how to find historical records and the 2016 Indiana Bicentennial. There will also be a hands-on session showing attendees how to create simple protective enclosures for their documents. Lunch will be provided by the Indiana State Records Advisory Board, and a tour will be given of the Indiana State Archives. For Indiana librarians, Library Education Units (LEUs) will be available. The workshop is free but pre-registration is required - read the press release and download the registration form. The Indiana Genealogical Society now has 1,277 databases in the Members Only area. Each of Indiana's 92 counties has at least 5 databases. I am trying to find a grave of a Stillborn from 1950 in St Joseph County. Where would I find records as to the disposition of the body? I cannot find a birth record or death record. Would the County Health Department have any records? I do not know where to begin looking. I will be in Indiana in a few weeks and am trying to get my lists of what I need to do done. The baby I am looking for is: Ruth Ann Ware, 16 April 1950. Thank you for any direction you can give me. The Genealogy Center of the Allen County Public Library in Fort Wayne will discuss how to search Ancestry.com on Wednesday, June 11 at 3 pm in the library's Meeting Room A. It isn't quite as easy as it looks on the television commercials, but Ancestry.com has millions of records of records and connections, just waiting for you to find them. Delia Bourne will show some techniques to make your search more successful. This is a free event, part of a summer series focusing on 5 of the most important online genealogy sources (see http://www.genealogycenter.org/docs/digital2014). To register, please e-mail Genealogy@ACPL.Info or call (260) 421-1225. The Indiana Genealogical Society now has 1,276 databases in the Members Only area. Each of Indiana's 92 counties has at least 5 databases. The Indiana Genealogical Society now has 1,275 databases in the Members Only area. Each of Indiana's 92 counties has at least 5 databases. The Indiana Genealogical Society now has 1,274 databases in the Members Only area. Each of Indiana's 92 counties has at least 5 databases. The Indiana Genealogical Society now has 1,273 databases in the Members Only area. Each of Indiana's 92 counties has at least 5 databases. According to the 1910 Census, my grandmother (whose maiden name we know as LaNita Arlene Davis) was living as a ward with Cora B. Davis in Battle Creek, MI. The census states that LaNita was born in Indiana. We have a birth date of 25 Jul 1904. Do you have any suggestions for how to locate a copy of her birth certificate? ARE HARDIN DENHAM AND HEZEKIAH STOUT DENHAM (1802-1886) BROTHERS? IF DAVID DENHAM IS THE FATHER OF HARDIN, ARE THEIR PARENTS THE SAME? WHO IS THEIR MOTHER/MOTHERS? WERE THEY BOTH IN THE MILITARY TOGETHER FROM INDIANA? WHAT COUNTIES DID THEY LIVE IN AND HAD FAMILIES? ARE THEY BURIED IN THE SAME CEMETERY WITH THEIR PARENTS? WERE EITHER OF THEM PART OF THE MELUNGEON OR NATIVE AMERICAN RACE FROM THEIR PARENTS? IF SO, WHAT TRIBE AFFILIATION ARE THEY INCLUDED? HAS A DNA BEEN DONE ON EITHER OF THEIR LINES? THANK YOU FOR ANY HELP, SHARING, DIRECTION, OR SUGGESTIONS. Ron Darrah will present a program on "Indiana Territory Genealogy" at the Wednesday, May 14 meeting of the Allen County Genealogical Society of Indiana. The meeting will be held in Meeting Room A of the Allen County Public Library in Fort Wayne and will begin at 7 pm (gathering time is 6:30 pm). The meeting is free and open to the public. Goldie Gaston Clark was born 29 Sep 1897 in Paris, Illinois. She married Charles Conway Stone 26 Aug 1915 in Vigo County, Indiana. The marriage record has a handwritten notation: "This license was issued by consent of the Board of Children's Guardians". I assume this means she was in a children's home. Goldie left Charles and four children sometime around 1923 or so. The divorce was finalized 9 Sep 1927. For many years I have tried to find what happened to Goldie Clark Stone after she left the family. I have never found any trace of her after the 1920 census. She did not appear in court for the final divorce hearing. Goldie's parents were John L and Della Mae (Bartlett) Clark. The 1910 census shows John as being divorced with three daughters: Alma A. Clark, Goldie G. Clark, and Gertha F. Clark. Any suggestions or information? Thank you for any help anyone can provide. An order for a tombstone, placed in 1860. 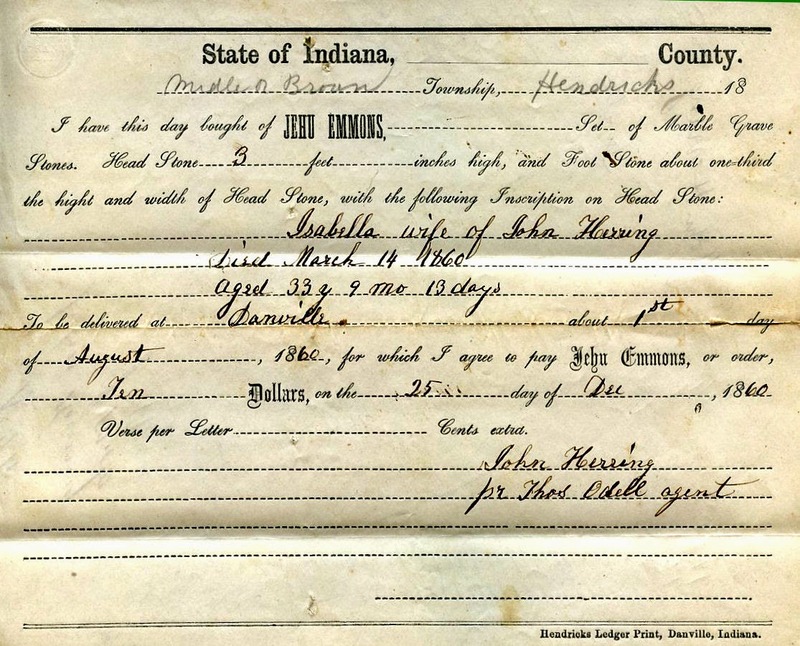 The Indiana Genealogical Society is flattening and organizing documents from Hendricks County probate packets from 1824-1900 in preparation for them to be digitized and placed online for free access. Probate records include estates (for those that died and left behind some property or debts) and guardianships (for children who inherited some property, or adults who could not take care of themselves). The documents in probate packets contain fascinating details of what life was like and what things were worth in the 1800’s. Stop by our next work session on Saturday, July 5, 2014 anytime from 10 am to 4 pm on the 2nd floor of the Plainfield Public Library. We'll be working on records from the 1870's through the 1890's. We've worked on 3,600 packets so far, and over 800 of them are online already. For more information about this project, please visit our Records Preservation Project page. Questions? Contact webmaster@indgensoc.org. The Genealogy Center of the Allen County Public Library in Fort Wayne will hold a free class about the Fold3 site on Wednesday, May 14 from 3 to 4 pm in the library's Meeting Room A. Delia Bourne will show how to browse and search records in this premier collection of military records, newspapers, and city directories. This class is free - please register by e-mailing Genealogy@ACPL.Info or calling (260) 421-1225. The class is part of a summer series, "Digital Discoveries" (download the brochure at www.genealogycenter.org/docs/digital2014). Upcoming classes will focus on Ancestry.com (June 11), FamilySearch (July 9) and NewspaperArchives (September 10). Hello....we are two boy scout brothers that are working on our genealogy merit badge. We would appreciate it if you could tell us what genealogical services, records, and activities your institution provides. We do have a great-grandfather that has family roots in Hammond, Indiana. His name was Valentine Domagalski. He married Gladys Huxley in Liverpool, England. They had three children, Wanda, Mary, and Valentine. He was in the US Army. They returned to Hammond, IN around 1953/1954. We believe he was born in 1918 and died around 1977/1978. The LaPorte County, Indiana Genealogical Society will meet on Tuesday, May 13 at 7 pm Central at the LaPorte City Parks and Recreation Department Building (250 Pine Lake Ave., LaPorte IN). Vicky Rydzynski will present a program about the holdings of the Archives and Records Center of St. Joseph County (1140 S. Lafayette Blvd., South Bend IN). The border between LaPorte County and St. Joseph County changed over time, and especially for those in the eastern part of LaPorte County, they may have also appeared in St. Joseph County records. The meeting is free and the public is welcome. Refreshments will be served. The Mishawaka Public Library will hold a Genealogy Roundtable on Thursday, May 29 at 6:30 pm. Beginners and experienced researchers alike are welcome to chat about their family history research. For more information, please contact Deanna Juday - d.juday@mphpl.org. Twigs from the Tree of Life, a genealogy group in South Bend, will discuss the Fold3 subscription site on Tuesday, May 25 at 7 pm at Christ the King Lutheran Church in South Bend (17195 Cleveland Rd., South Bend IN). Instructor Lisa Ellam (ellam.lisa@gmail.com) will discuss Fold3, which has the premier online collection of military records. The Fold3 name comes from a traditional flag-folding ceremony in which the third fold is made in honor and remembrance of veterans. This meeting is free and the public is welcome. The Marshall County Genealogical Society will lead a tour of cemeteries along Michigan Road between Plymouth and Argos on Tuesday, May 20. A progressive dinner will also be offered to visitors - at each cemetery stop, visitors will be given another course of the meal, along with a brief and colorful history of the cemetery. For more information, please contact Karin Rettinger - phone (574) 936-2306. The Indiana Genealogical Society has added the March 2014 issue of Indiana Genealogist, the quarterly publication for our members, to the IGS Records section of the Members Only area.